Canada England, IrelandSpotlight on the bike helmet law debate in England and Ireland Web linksA comprehensive link directory for websites concerning bicycle helmets ContactIf you have a query, send a message. 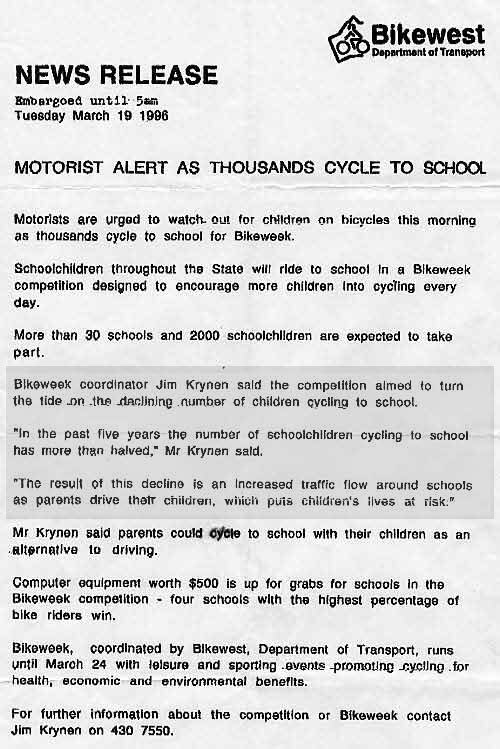 Below is a 1996 media release issued by Bikewest - the cycling promotion and research department of the Western Australia government. It confirms other survey evidence that more than half the school children in Western Australia had stopped riding bicycles in the five years following 1991. What happened in 1991? Western Australia enacted mandatory bicycle helmet laws. Eighteen years after law enforcement, both the number and proportion of children cycling to school in Western Australia remained way below their pre helmet law average, causing significant health problems and worsening road safety. Based on data from Western Australia, Queensland and Victoria, it was reported in March 2007 that the number of Australian children walking or riding a bicycle to school has plunged from about 80% in 1977 to the current level around 5%. In November 2010 the Australian Bureau of Statistics released Children's Participation in Sport and Leisure Time Activities (PDF 442kb) which found the number of Australian children engaged in organised sport or dance increased from 64% in 2000 to 69% in 2009. However, the ABS found "Children's participation in bike riding decreased from 64% in 2000 to 60% in 2009. Boys' participation in bike riding (71% to 66%) decreased more than girls' (56% to 54%). The average time that children spent bike riding also decreased from 6 hours in 2000 to 5 hours in 2009, with the average time that boys spent (7 hours to 5 hours) decreasing more than girls (5 hours to 4 hours). "Boys who cycled to school were 30 percent more likely to be fit, but there was an even more dramatic difference in fitness among female subjects. Girls who biked to school were seven times more likely to reach the minimum fitness standard than girls who used motorized transport." "At the same time the proportion of children cycling to school is now so low it is statistically too insignificant to be considered on its own, says Hume, of Deakin University's Centre for Physical Activity and Nutrition Research. Hume says the decrease in what is known as active commuting has occurred at the same time as obesity rates among children have increased. Although, the researcher says "it is drawing a long bow" to directly link the two, the decrease in walking and cycling to school is part of the overall reduction in physical activity amongst children." 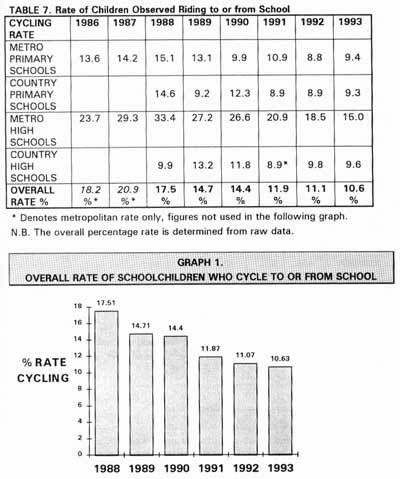 It should be noted that in 1979, 70% to 80% of children in Christchurch, New Zealand, rode their bicycles to school. New Zealand introduced national, all-age mandatory bicycle helmet laws in 1994. Today, it is estimated that 21% to 35% of Christchurch children cycle to school. Bicycle helmet laws discourage cycling among children and create the misapprehension among parents that cycling is a dangerous activity. 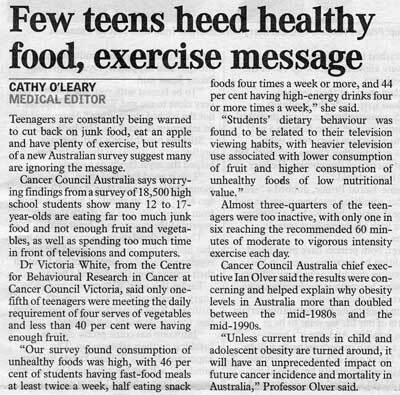 The 2008 WA Child and Adolescent Physical Activity and Nutrition Survey (PDF 280kb) reports that 21.6% of WA primary school boys and 17.6% of WA primary school girls claimed to have ridden a bicycle to school in the previous seven days, while 13.6% of secondary school boys and 4.1% of secondary school girls claimed to have ridden a bike to school. The survey showed more than half of WA children are at risk of health problems in later life because they are not exercising sufficiently, with about 60% of boys not getting the recommended one hour of daily physical activity and 70% of primary school girls and nine out of 10 high school girls missing out. In 1981, only 24% of children in the South Australian capital city of Adelaide were being driven to school in a car and 55% of them either walked (42%) or cycled (14%). 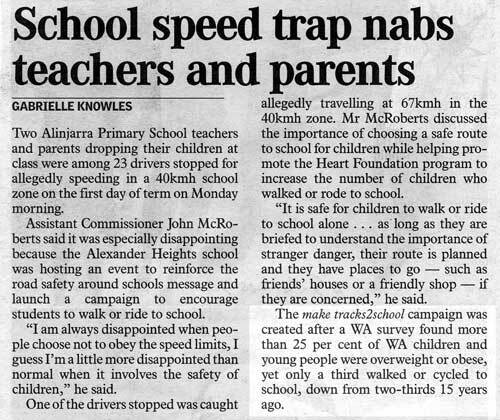 By 1997 and after the introduction of mandatory helmet wearing, 60% of Adelaide's children were being chauffeured to school and only 24.5% of them either walked (20.5%) or cycled (4.5%). 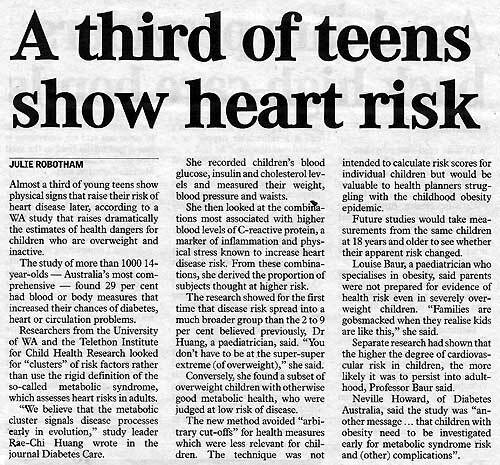 Deakin University research published in early 2008 (PDF 70kb) shows that five and six year old children are only half as likely to have weight problems as children without a dog, reflecting the need for recreational activity to reduce obesity. Between 1990 and 2001, vehicle greenhouse gas emissions in Australia rose by 17%.